The master of horror returns to Dark Horse! For nearly fifty years, Richard Corben has been terrifying readers with his unique visions of the macabre and the horrific. On December 14, 2016, the Eisner Hall of Famer launches his newest nightmarishly beautiful series: Shadows on the Grave. Shadows on the Grave is an eight-issue mini-anthology of bizarre horror stories told in Corben’s signature black-and-white style. Each issue of Shadows on the Grave features four tales of horror, including the ongoing saga of Denaeus, a Greco-Roman-era version of Corben’s Den from Heavy Metal. Yeah, yeah, so Mike Mignola and Richard Corben‘s graphic novel (though it’s only 56 pages, so novella?) Hellboy: House of the Living Dead is two years old, having been published back in 2011. But I swear there’s a good reason you’re seeing, and hopefully reading and commenting on, this review. First of all, I just got it in the mail from Amazon and read it as fast as I could, in probably about 30 minutes or less, because I just had to keep going. 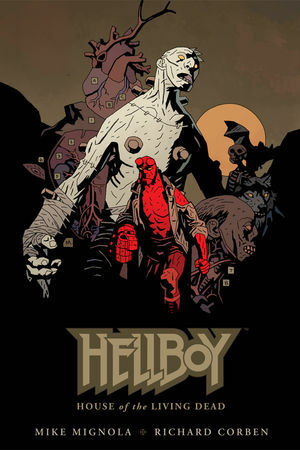 And secondly, with Hellboy: The Midnight Circus, Mignola’s next Hellboy graphic novel, just around the corner (November), it seems an apt time to reflect on the most recent novel-length graphic narrative of the ‘man’ with the Right Hand of Doom. House of the Living Dead is a tribute to the classic Hollywood monster movies of the 1930s and 1940s. Mignola dedicates the book to Boris Karloff (the mad scientist in Frankenstein and sequels, 1931-1939), Glenn Strange (the monster in Karloff’s movies and others), John Carradine (the Count in sequels to Dracula starring Bela Lugosi), and Lon Chaney Jr. (“the always sad Wolf Man”). With this in mind, and Mignola’s apparent affection for “Mexican-wrestler-vs.-monster movies” (which he says he’s never seen, but likes the idea of), House of the Living Dead is both a wonderful nod to the roots of America’s popular non-literary addiction to the classic monsters that had their origin in European Gothic fiction of the 18th and 19th centuries, as well as a glimpse into a dark period of Hellboy’s early years. The narrative is as unique as any Hellboy tale, but probably a bit weirder than your average experience with comics and graphic novels. Mexico, 1956 (so Hellboy is 12 in our world, 312 in reality). 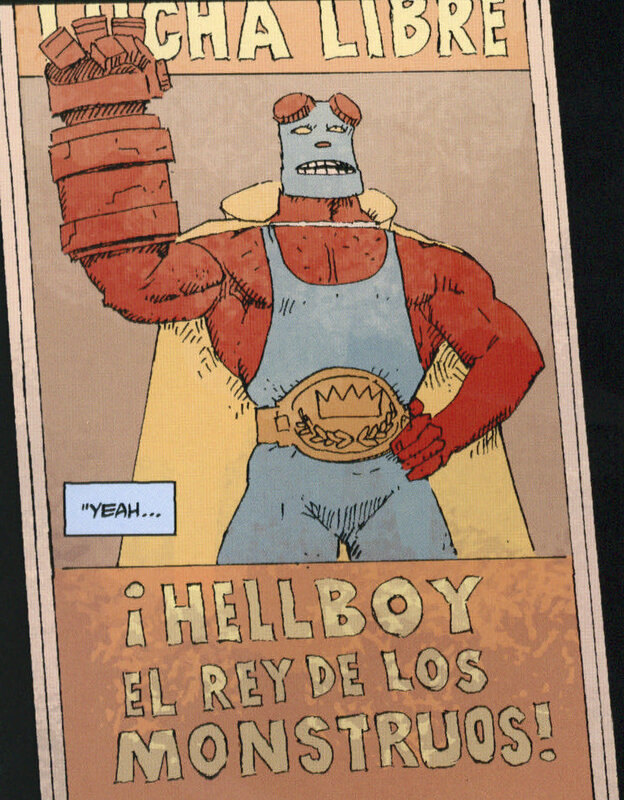 Hellboy has become a champion luchador (say, what?! ), but even that wasn’t able to save his pal Esteban from being sired by vampires and turned into Camazotz, a hulking vampire-luchador whose visage reminds me of the Batman: Knightfall version of Bane, but which is actually a bat god of the K’iche’ Mayans (the word means “death bat”). After another successful fight, Hellboy is asked by a man to come fight a mad scientist’s champion or else a girl will be murdered. Well, Hellboy obliges…and the monster turns out to be a Mexican Frankenstein’s monster knock off. We learn that the scientist was desperate for his monster to fight Hellboy because a groups of hellion imps ordered him to–yeah, this definitely fits into recent continuity. One thing after another confronts Hellboy: the monster turns out to be a good guy, and goes to kill the scientist; the house (you know, “of the Living Dead“) burns down; zombies attack; Raul saves the girl he threatened, then turns into a wolf-man and shoots the girl; Hellboy knocks out the wolf-man, but the girl’s blood awoke a Mexican Dracula, which Hellboy kills in one fell swoop; vampire-witch-ghosts torment Hellboy and remind him of Esteban’s death (so they sired him…); and with his last breath wolf-man Raul uncovers a glowing crucifix and prays, killing al the vampires and lighting Hellboy on fire. Whew! If you think that was a roller coaster ride to read, then you’ve got a little taste of how fast paced and jam-packed with zany and sometimes purposely campy Hellboy: House of the Living Dead is. In short: it’s a must have graphic novel for anyone, even someone who’s never read Hellboy, though a few nuances might be lost. Both Mignola and Corben strive to make the point that the most human characters in this work are the monsters, and that the humans are the ones who act like monsters. This is what draws me to Corben’s art, his ability to make humanity ugly because sometimes it deserves to be, and perhaps is one of the reasons he is acclaimed as the greatest graphic adapter of Edgar Allan Poe’s works–he truly understands how to interpret the Gothic message for a modern, comic-reading audience. This is why Corben and Mignola are such a perfect pairing. The reversal of the reader’s opinion of (hu)man and monster is mot an unusual take on what it means to be human in postmodern art and media, but certainly a unique one that achieves its end by drawing on the extremes of humanness and imbuing them in the monsters: alcoholism and depression (‘the bad’) vs. redemption and heroism (‘the good’). It’s these attributes that make Hellboy more of a man than the mad scientist or Raul, and the scientist’s Monster’s refusal to be, well, a monster, that makes him a paragon of virtue. They can be humans even when they struggle with their existence, while humans can’t even figure out health care reform or marriage equality. Hellboy fans, horror fans, classic movie fans, wrestling fans…hell, anyone who has ever wondered what it means to be human: Hellboy: House of the Living Dead is for you. Those who know their comics, know that Dark Horse means horror (among other things), and there’s no better showcase of this than series like Eerie and Creepy, which are Dark Horse’s hallmark to the horror comics of the 1960s and 1970s, using the same names of the Eerie and Creepy magazines published by Warren Publishing (Vampirella), which was a big competitor with DC and Marvel until 1981, and they were able to put out risqué comics banned in regular comic books because they published in magazine format, which was not restricted by the Comics Code Authority. Like those old magazines, Dark Horse’s Eerie #3 is a horror anthology featuring weird, out-there stories, the general goal is which are to be unsettling. Not to mention a fantastic cover by Paul Chadwick. Issue three is composed of three short stories by different artistic teams. “Hunger,” penned by Landry Q. Walker and drawn by Troy Nixey, who has worked on some Mignola books, is a weird exploration of what happens to an alien stranded on Earth, and a criticism of our largely empty calorie diet. Walker builds a rather strange story, if not slightly predictable in its oddness, and the final turn is rather funny in that I-shouldn’t-laugh sort of way. What makes this first story incredible is Nixey’s black and white pencils, which create a complex, detailed world which highlights the erratic, frightful nature of the story, and makes the experience unbelievably gross (but cool). Imagine if the plot of The Search for Spock had involved Spock being reborn in the body of a grotesque, multi- ocular monster that can devour anything by absorbing and digesting it through its skin. Also, imagine that a woman were in love with Spock previous to his demise, and that that woman still wants to spend the rest of her life with the new green-bodied monster. Gerry Boudreau’s “The Manhunters” illustrated by Wally Wood has basically that plot, and it’s of the highest class mid-20th century sci-fi. Little else needs to be said, other than perhaps praising Wood’s ability as a colorist (my god, those bright and stark contrasts!) and artist, since his work is entirely enjoyable and captures the weird feel of the narrative. Writing a short story is embarking on a dangerous journey of critics and fans and haters who will claim the work is “too short,” “not fulfilling,” “left me wanting,” but good short stories is exactly what Eerie #3 presents here. Each of these stories is classic horror or sci-fi, with enough content to feel satisfied but with a diegetic world interesting enough to be explored in future comics or in the reader’s imagination. As a fan of old horror comics, I’m definitely looking forward to more from Cousin Eerie (and Creepy). My only complaint lies in the fact that I believe at least the last story is a reprint, since Wally Wood died in 1984, and it would certainly be eerie if Wood were making new art for Dark Horse. My complaint is miniscule, just that I couldn’t find citation information if this is indeed a reprint, because I completely enjoyed the comic regardless of being a reprint, and these classic horror/sci-fi pieces need to be brought back to the present readership. After some research, I discovered that “The Manunters” is a reprint from 1974’s Comix International #2 published by Warren Publishing. While this was the only reprint I thought to look for, it’s possible other of the contents are as well—but that’d be no reason to think this a bad book, just proof that the comics therein are in fact worth the read! Finally, I love Eerie’s creation of the Cousin Eerie mythology and the back-up interview with Richard Corben, one of my absolute favorite artists and Poe-adaptationist par excellence. In the interview Corben provides an interesting perspective on editors, since he says that horror comics editors have gotten more relaxed over the years, whereas mainstream opinion sees superhero comics editors as ruling with an “iron fist” (the same phrasing used by Corben about earlier horror editors, probably a result of the new Comics Code Authority and today’s lack of such restrictions). If you like horror and sci-fi, or good art, or you want to explore the possibility of short-story comics, Eerie #3 is the book for you! It’s an anthology and a learning experience for just $3.99. Dark Horse, if you’re reading: thank you. It’s books like Eerie #3 that I hope to edit someday soon and bring well-written quality comics to readers everywhere, and it’s further proof that Dark Horse is the company. This review takes the Edgar Allan Poe’s Fall of the House of Usher #1 and #2 into consideration as both an adaptation and an original work for those unfamiliar with Poe’s 1839 original short story of the same name, and the final rating and recommendation reflect my feelings on the comic as both adaptation and original. Reading through Richard Corben’s Edgar Allan Poe’s Fall of the House of Usher felt like a literary analysis of Poe’s story writ for the comic enthusiast; bye-bye to lectures on thematic and symbolic elements of “The Fall of the House of Usher,” hello to this wonderful comic worthy of its own interpretation and analysis and just plain pretty (in an eerie sort of way). Corben combines the plot for this comic with another of Poe’s works, “The Oval Portrait,” which is somewhat akin to Wilde’s Picture of Dorian Gray. In addition, the narrator in this comic is Mag the Hag, introduced in Corben’s adaptation of Poe’s poem “The Conqueror Worm” (comic has the same name) which came out last November (2012), and Corben features Poe himself, as ‘Allan,’ as Poe’s original unnamed narrator. As an adaptation, Corben does a great job capturing Poe’s major themes: the creepy life-like quality of the House of Usher, Roderick Usher’s madness (though Corben’s Roderick is more psychopathic and less derranged than Poe’s man), and the incestuous relationship between Roderick and his sister Madeline. Corben took great liberties with their relationship, making Madeline a central figure to whom Allan becomes attached. Allan is quite talkative, not the quite, concerned narrator that he is in the original—this doesn’t detract from the story, but Corben’s script for Allan seems out of place with the 19th century setting. Corben’s unique twists to the story modernize it; I’m sure many reader’s would find Poe’s original somewhat bleak. But where Poe uses pages full of eloquent narration to express in literature the dense oppression of the atmosphere of the House of Usher and the hair-standing-on-your neck vibe, Corben instead has his masterful artwork to accomplish this task in an equally effective manner. His style is well suited to this type of Gothic work, as he’s worked with Mike Mignola a number of times, and got his start submitting to Creepy and Eerie, among plenty of other successes. Corben’s panel ecology in The Fall of the House of Usher is complex, with edges rumbly and mottled except where human characters are concerned, giving the whole book a feeling of being visually unsettled in the same way that Poe’s original story leaves the reader with a somber, heavily laden fog of depression milling about his narrator’s environment. The best example is the longshots of the House of Usher, the edges of which are so busy as to make the house seem—quite literally—alive, much as it has been suggested Poe meant, alive and overgrown with sentient fungus! And the ‘death’ of the House of Usher is even more spectacular under the penmanship of Corben than in the original (though, admittedly, readers in 1839 probably hadn’t read too many stories in which a house crumbles when its owners die), where it almost seems a final anecdote which the read is left contemplating. Then again, forced reflection is sometimes the key to brilliant writing. Creepy. That truly is the best way to describe Corben’s eerie adaptation on the whole, both story and art, all of it seeps through the pages and into the mind like an unforgettable horror story populated with too eccentric madmen and unnerving twists. And while the dialogue is at times awkward, at least for someone who greatly enjoyed the original, I would contend that Richard Corben’s Fall of the House of Usher will be remembered for some time, and if ever I get the chance to teach Poe, my students will surely also be reading this adaptation. Dark Horse’s continues to expand it’s with the announcement of comics legend Richard Corben’s adaptation of Edgar Allan Poe’s classic poem The Conqueror Worm. In Edgar Allan Poe’s The Conqueror Worm, a betrayed man hunts down his wife and her lover, only to stumble upon a gruesome puppet show based on his life. This series will be rotten to the core! Corben will also be lending his talents to Dark Horse Presents, penning additional spine-tingling stories by Edgar Allan Poe. Edgar Allan Poe’s The Conqueror Worm is on sale November 21, 2012!